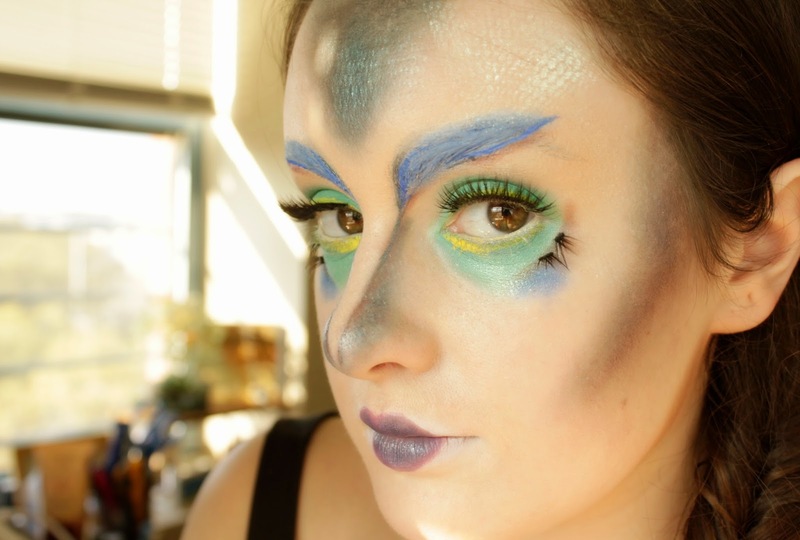 Led By The Moonlight: A Beauty Blog For Beautiful Dreamers: Tropical Fish Makeup: My Halloween Makeup Test-Drive + Video Tutorial! 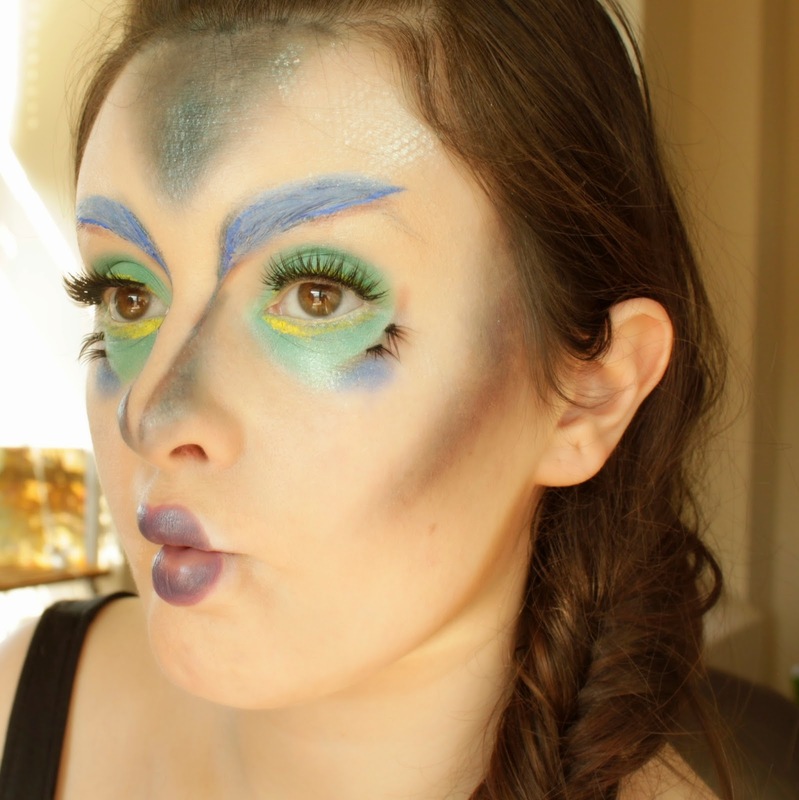 Tropical Fish Makeup: My Halloween Makeup Test-Drive + Video Tutorial! I'll be honest: I am kind of recycling an old costume for this year's Halloween. But hopefully with much better makeup. About three years ago I was the Rainbow Fish for Halloween and I made my own dress using a blue tank dress from American Aparrel, a homemade scale stencil and purple & silver spray paint. I've kept the dress all this time, and wanted to challenge myself to go all the way with the makeup this time. 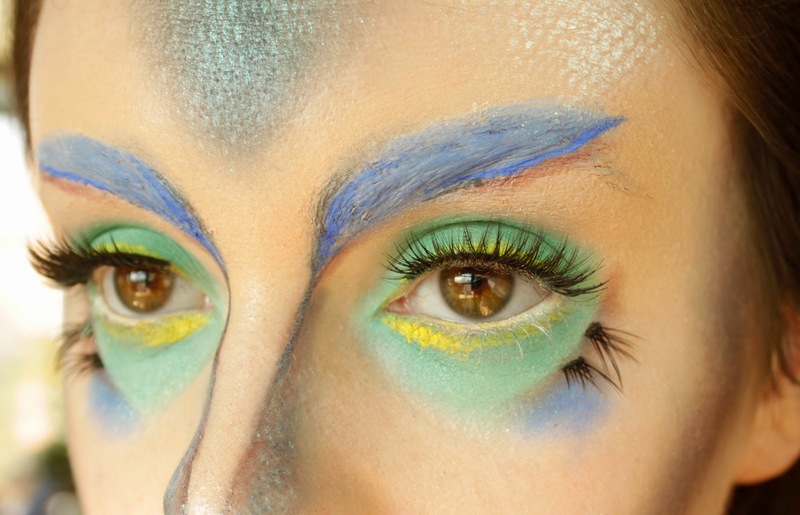 In the last iteration of this look, I just drew on some super-circular eyes and called it a day. I'm glad I did a test run of this because I'm not totally happy with it, but now I've got some really concrete ideas of how I can tweak it. 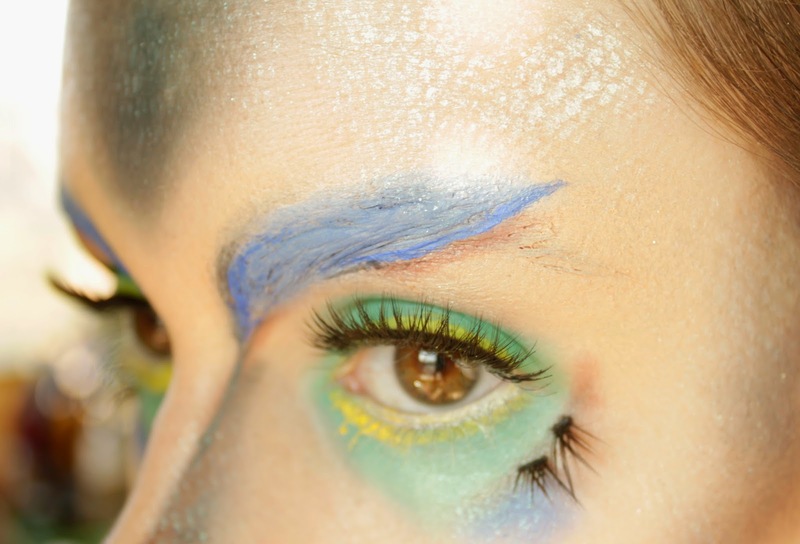 I thought that blue and turquoise contouring would be enough, but now I see I need to go full-on blue face; some water-based face paints are on their way to my apartment as I type. I am, however, really happy with how the pigments work in this look. The Makeup Geek Insomnia pigment (a beautiful dupe for MAC's Blue Brown pigment) and Suparpill's Lumi worked fantastically. I used Insomnia over my contour to keep it dark but add a marine-inspired glisten, and Lumi was perfect for creating a scale-effect with some mesh as its guide. I'l also be rethinking the brow shape; I think as it stands now the blue brows resemble human eyebrows too much, so I'll probably place the final ones higher and make them more circular. 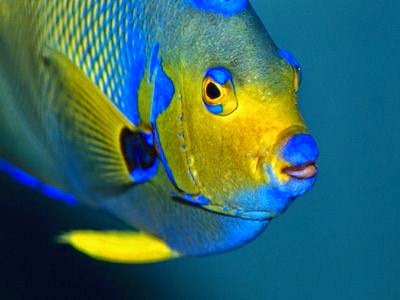 I think I can also draw some inspiration from the stripes on this fishy's side fin! Keep scrolling to see what I used & watch the sped-up video I created from this look. (for eyebrow concealing): Elmer's Washable Glue Stick; bareMinerals Original Foundation in Fair; Inglot Concealer in Pink Color Correcting.